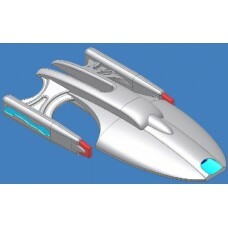 The F. E. D. Norway Fast Cruiser is the quick solution out of any bad situation! This powerful little cruiser is deceptively powerful and a quick responder to any crisis it is called upon, with the firepower to back up any threat. It can out run any ship in the quadrant, but rarely needs to since it usually leaves wreckage in its wake, even when outgunned it is able to disable and tear apart aggressive ships that refuse a diplomatic solution. It is also a very capable transport in dire situations by providing needed transport or supplies almost as quickly as they are requested. Pray for this ship to arrive in your need! It is cast in no lead pewter 2"L x 1"W x 3/8"H (51mmL x 27mmW x 9.5mmH) unpainted, and a 1" Hex Black Plastic Flight Stand is not included.